If you have been to the newly-opened Sun Tavern on the Museum Commons, you may have noticed the sign hanging outside. This was designed by a local artist based on Fairfield Museum staff's extensive research on eighteenth-century tavern signs. 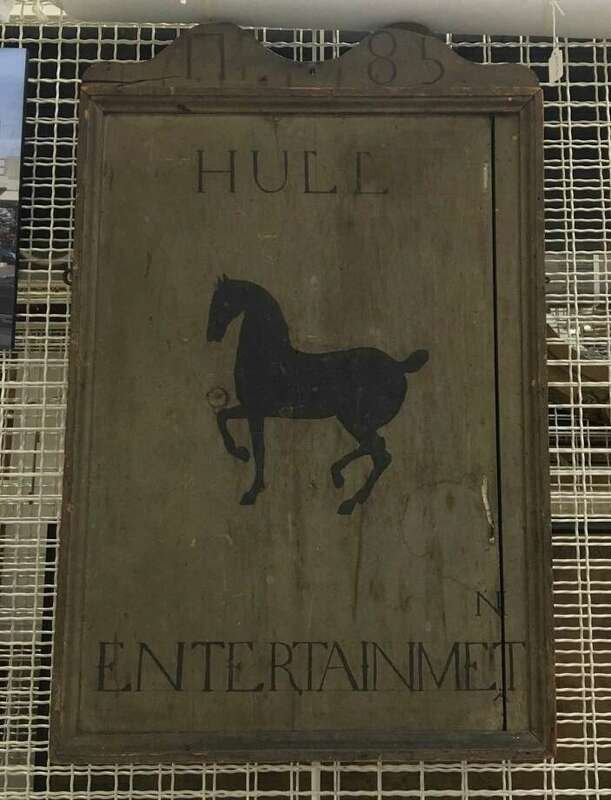 This 1785 sign from the Museum's collection promising “Entertainment” marked Hull’s Tavern, which was built in 1772 by Lewis Goodsell (the son of Greenfield Hill’s first minister), and then operated by Stephen Hull. One memoir recalled the tavern on Hulls Highway in Greenfield Hill doing a brisk business, hosting regular dances with wine, plum cake, and a fiddler. It was one of several taverns in Fairfield in those years; in addition to Penfield's Sun Tavern and Bulkley's tavern near what is now Town Hall, Molly Pike ran a flourishing tavern in Southport and Knapp's and Benson taverns also served the center of town. This sign will be on display in the Museum's newest exhibition, "Signs of the Times," which opens August 10 and will remain on view through November 26. The exhibition displays some of the signs that have been used in and around Fairfield to help people find their way, identify local businesses, get community news, and commemorate the past. The black horse on this sign was found on many tavern signs throughout the colonies and the word “entertainment” was used to convey that food and lodging were available within - “for Man and Horse,” as some other signs proclaimed. A passerby would recognize the imagery and know the building was a tavern, just as we recognize certain commercial logos today. The Fairfield Museum and History Center is located at 370 Beach Road. Learn more about the history and culture of Fairfield, view rotating exhibitions and purchase Fairfield-themed gifts at the Museum Shop. Open daily 10 a.m. to 4 p.m. For more information visit Fairfieldhistory.org or call (203) 259-1598; Fairfieldhistory.org.